It's the summer holidays! We are loving these long, lazy days of just going with the flow, playing all day long and relaxing. If you follow me on Instagram or Facebook you may have noticed that there is one thing that I am trying to do each day with the children, and that's read! 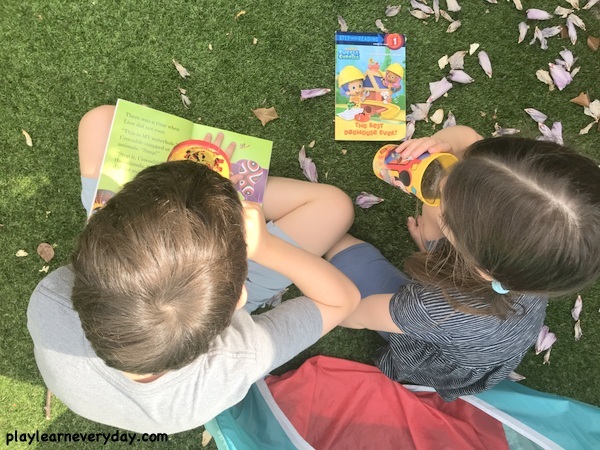 It's so important to keep Ethan reading over the summer and to build on Ivy's growing love of books as she is just learning to read. So every day I make smoothies for all of us (get some healthy food in there too!) and we each choose a book to read! It's called Smoothies and Books and it's one of our favourite parts of the day! We have a great selection of books at home, and we have also been visiting the library and we're taking part in the Summer Reading Challenge here in the UK, which we highly recommend (hopefully libraries worldwide have similar programs). It's another great way to inspire the kids to keep reading all summer long. Read Write Inc Phonics - this is the reading scheme that I used when I was a teacher and I really loved the whole process, so the books are great, especially at the lower levels. Read it Yourself with Ladybird - a lot of these books are of characters or stories that are familiar to the children, which is a fun way for them to get into the books. The Gruffalo (and anything else by Julia Donaldson) - a modern classic and just so much fun to read and do all the different voices! The Doctor with an Eye for Eyes - a great introduction to Patricia Bath and a great stepping stone for learning more about great women in history. Oi Frog! (and the other books in the series; Oi Dog!, Oi Cat!) - a hilarious series of books that makes fantastic use of rhyming words and I absolutely never get tired of reading! How to Catch a Star (and anything else by Oliver Jeffers) - such a sweet and funny book about a boy on a mission who never gives up. Zoey and Sassafras series - finally a series that is aimed at younger children and features a fantastically clever and strong girl character, we love Zoey! How to Train Your Dragon series - another great series that isn't too intense for younger children and that Ethan loves to follow along with, great for imagining up situations with real dragons and adventure! Charlie and the Chocolate Factory - my personal favourite by Roald Dahl that inspires a whole lot of creativity! Captain Underpants - because sometimes you just have to be silly! Pokemon Handbook - kids don't even know they're reading when it's all about their favourite Pokemon characters!